This was a lesson that Rotherham have learned many times before, but it never gets any easier to take. Fail to take your chances in the Championship and you will be punished. That is exactly what happened as the Millers conceded a late goal to draw 1-1 against a Bolton side there for the taking. For much of the game it looked like Paul Warne's men were going to oblige as they put in a strong performance and led through Will Vaulks' brilliant second-half free-kick. By then they had already spurned a number of chances, including an embarrassing Kyle Vassell miss before half-time, while they had even better opportunities to extend their lead, with Michael Smith hitting the post with a curling effort from distance. 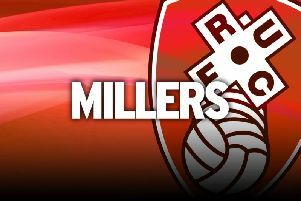 Anyone who has watched Rotherham in the Championship for long enough might have predicted what was going to happen next as, with just five minutes of normal time remaining, one-time Millers target Christian Doidge scored a goal out of a long punt up the field and earned Bolton a point they barely deserved. It robbed the Millers of a first win in six in the sort of game you would expect they need to be victorious in if they are to head above water in this relentless division. Warne, more than anyone, feared what was coming after a string of missed chances. He said: “I never think that it is safe, I am bit more experienced, until the whistle goes I am virtually having a heart attack. They had four strikers on, they were obviously going to be direct so I knew they would create something. This was also a tale of two penalties, as Bolton's only other real foray into Rotherham's penalty area other than their goal saw them awarded a spot-kick after some pretty slapdash defending from Richard Wood early in the second half. Luckily for the skipper goalkeeper Marek Rodak got him out of trouble with a brilliant save to deny Josh Magennis from the spot. Then, after Vaulks' fine 25-yard free-kick rocketed into the bottom corner, the Millers thought they should have got a spot-kick when Ryan Manning appeared to be clearly tripped. Referee John Brooks instead booked Manning for diving and the Millers went on to pay the penalty.